Frilled Dragons are arboreal lizards that live in tropical areas of Australia and New Guinea. They spend most of their time high up in the trees waiting for their next meal or soaking up the sun. In the pet trade you will find 3 varieties of frilled dragons. There is the New Guinea Frilled Dragon which is the most common in the pet trade, the Australian Frilled Dragon which is the rarest and most expensive and lastly there is the hybrid cross between the two. When choosing a frilled dragon it is important to be able to distinguish between the Imported/Wild Caught and the Captive Born and Bred ones. Captive Born and Bred (CBB) species are the ones you will want to purchase because majority of the time they are much healthier specimens. Imported animals are farmed over in Indonesia and are sometimes only captive born babies with wild caught parents. 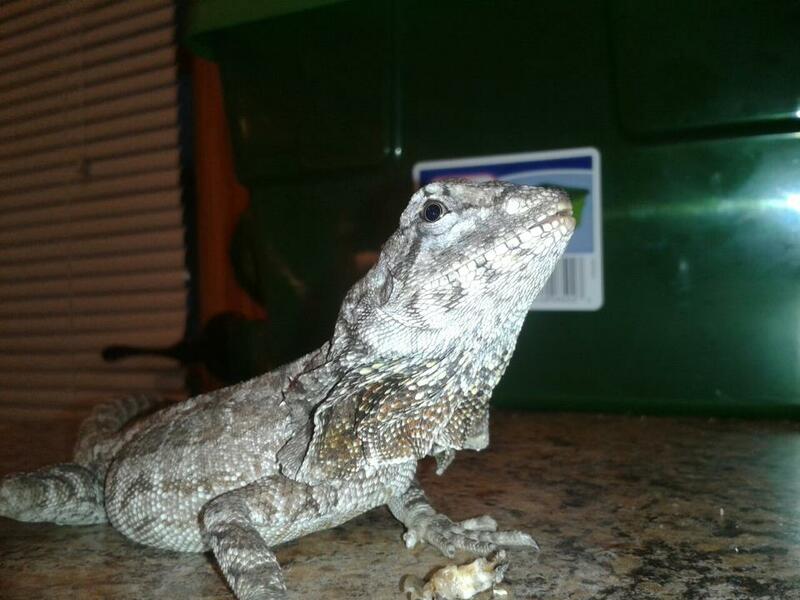 Typically with Imported/Wild Caught frilled dragons they are ridden with internal parasites, mites and ticks. You will find they usually have folds in the skin and shed skin that will not come off due to dehydration issues. Imported/Wild Caught frillies are usually much more difficult to tame and to get acclimated to a captive lifestyle. A special thanks for this photo courtesy of Bradley Schaefer. Australian (Queensland Locality) - Typically called the Yellow Phase.They usually have larger frills, little to no body pattern and reach sizes from 2 to 3 feet. The Australian Frilled Dragons typically have white "cheeks" no matter which locality. Australian (Northern Territory Locality) - These are the Frilled Dragons that you see with the deep brownish/red body color and reddish orange frills. They usually have black stomachs starting from the neck down. This locality has huge frills, fatter tails, and larger heads and usually gets about 2 to 3 feet. New Guinea - The most common in the pet trade (aside from Australian pet trade). Length typically 18" to 24". Smaller frills in comparison to Aussies with a yellow inner frill. Body color is a charcoal/deep brown color with gray pattern. New Guinea x Australian Hybrid - This is a mix between the New Guinea locality and the Australian localities. They get slightly larger in size than the New Guineas and can have reddish inner frills but most have the absence of the white "cheeks". Frilled dragons are arboreal lizards meaning that they spend most of their time up high. When looking for an enclosure for a frilled dragon height is a very important factor. When it comes to decorating the enclosure you can use fake rock walls, branches to climb, vines, rocks, waterfalls, misters, and fake plants or real ones. When using real plants take into consideration which ones are edible and possibly toxic to your frillie (you can check out the nutrition page on beautifuldragons.com for a list of good and bad plants). Also when using real plants just take into consideration how badly your frillie can destroy them. Housing 2 or more frillies together is possible however I advise against it because no matter the gender combination you use there are risks you are taking when housing them together. Some of the possible risks are over breeding when housing a male and female, almost definite chance of one being dominated by another frillie (signs include significant size difference, lack of appetite in other frillie, “piling up” on the other frillie under the basking spot and possible wounds or missing digits such as toes, fingers and tail tips and in some cases death to one or both frillies is possible). Also if a frillie is sick it is more difficult if not impossible to tell which one is sick and if you do it has probably spread the illness to the other frillie. These are some of the risks included and not all the time are there physical signs. However, if you choose to house 2 or more frillies together be sure to provide multiple basking spots and monitor feeding as well as provide a cage large enough for 2 or more frillies. For baby and juvenile frilled dragons I recommend a minimum of a 29 gal tank. Too large of an enclosure may cause the dragons to feel stressed out so it is usually best to upgrade the enclosure as they grow. Adult New Guinea frillies do well in a minimum enclosure size of 4 feet high by 3 feet long by 2 feet deep. You can always keep your dragon in a larger enclosure but try to keep the height less than 6 feet to reduce risk of injury due to a fall. Aussies however, will need a slightly larger minimum enclosure with a height of 6 feet by 3 feet by 3 feet. There are many options for substrates to use and some are safer, more hygienic and easier to maintain than others. When choosing a substrate you can either choose a non-particle substrate or a particle substrate. Non-particle substrates such as paper towel, newspaper, reptile carpet and non-adhesive shelf liner are safer choices that have no risk of impaction but it doesn’t give proper humidity levels that frillies need. Particle substrates that are suitable for frillies are washed playsand, cypress mulch, bed a beast, repti-bark, eco earth or organic potting soil. It’s best to house younger frillies on non-particle substrate to reduce risk of impaction since younger frillies tend to be clumsier eaters than adults. They can then be switched to particle substrate at approximately a year old. **Avoid using tiles for frilles. Because their enclosures are much higher, their risk of injury if they fall is much greater because the tile has no cushion if they were to fall. When feeding live protein I find it easier, cleaner and safer to feed in a separate tank. The reason for feeding in a separate tank is simply to avoid having to take out the crickets, worms or roaches one by one so they don’t eat at your dragon if left inside their living quarters. It also doesn’t give them a chance to hide from your dragon making sure they get every last feeder in the bin and to help avoid the accidental ingestion of substrate. Not all dragons are readily willing to eat outside of their living quarters but with some time it can be done. If you decide to feed in the same tank as where they live always remove every prey item or else it can badly injure your dragon. The rule of thumb about how large the prey should be is that it should not be any larger than the space between their eyes. Soft bodied worms like silkworms, hornworms, butterworms, and waxworms can stretch the rule due to their lack of an exoskeleton but still keep in mind the size. Staple prey includes roaches, crickets, silkworms, hornworms, and phoenix worms (especially for babies). Superworms, butterworms, waxworms, and various fruits and greens (avoid citrus) can also be added for variety. Collard greens, mustard greens, dandelion greens, turnip greens and squash are all suitable staple greens to feed your frilled dragon although don't be discouraged if they never touch them. They are insectivores but some will take to greens. Pinky mice can be offered but it's best to limit 1-2 per month when your dragon is 14" or more. Babies to juvies should be fed as much as they can eat 2 times a day with live protein. Their meals should be supplemented with a quality calcium powder 6 days a week and 1 day a week with a quality multivitamin powder. NOTE: Phoenix worms are naturally high in calcium so they do not need to be dusted and can be used as a calcium supplement if fed as 1 meal a day. Adults do not need to be fed as much as babies and can be fed once a day. Calcium powder can be brought back to 2-3 times a week and multivitamin remains at 1 day a week. Gravid females should get calcium 5 to 6 days a week however. Hydration can come in many different ways for frilled dragons. Soaking your frilled dragon in shoulder deep water around 90 degrees (some prefer cooler and some prefer warmer)is one way of hydrating your frillie although not always the best or most reliable. Soaking however is great in aiding in shedding and promoting a good mental health and exercise. Misting the enclosure and frilled dragon helps with raising humidity and hydrating which is an important factor in husbandry. Providing a water dish is also a good way to help keep your dragon hydrated. Some people choose not to use a water dish and feel that soaking the dragon and misting is sufficient enough which is fine but dragons will utilize the water dish as well. If you choose to use a water dish it must be cleaned out at least once a day and refilled with fresh water. Bulbs you can use for heat don’t have to be pet store heat lights that cost your tons of money. You can simply use an incandescent house bulb or a halogen floodlight for your needed UVA/heat. Wattages needed will vary depending on the distance from the bulb to the basking spot, and ambient temperature in your house. Temperatures are one thing you will have to closely listen and watch your frilled dragon for to see if they should be raised or lowered. Temperatures ranging from 95* to 110* for a basking spot is great. Some dragons may like it a touch warmer but remember, going over 110* may cause dehydration issues, burning, or drying out the enclosure if you don't have the correct setup. Frilled dragons need a cool side of the enclosure as well that reaches temperatures of about 75* to 80*. The most accurate way to get surface temps is by using an infrared temperature gun. A slightly less accurate method is by using digital thermometers with probes attached to the basking surface. Both items are easy to find and somewhat inexpensive depending where you find them but are a necessary tool when owning any reptile. UVB lighting is a very important part to the lighting setup for your frilled dragon. UVB lighting is what simulates natural sunlight that the dragons need to be mentally healthy and utilize the calcium to help develop strong bones. Try to stay away from ALL compact fluorescent/coiled UVB bulbs because most have been linked to the burning of the corneas of reptiles and also give out a harmful amount of UVB. The better UVB lights are in the form of a long fluorescent tube or an Mercury Vapor Bulb (MVB). Each have their own pros and cons but remember that a tube UVB needs to be replaced every 6 to 8 months and MVB’s get replaced every 12 to 18 months. For optimal UVB exposure from a tube, keep your frilled dragon 6 to 8 inches from the light and if using a MVB, keep your dragon 12 to 16 inches from the light. *MVB’s produce UVB rays as well as heat although you still may need a secondary heat light to reach desired temperatures.